Leather jackets are the closet essential we can wear anywhere and with anything! Like skinny jeans and ankle boots, they’ve become a closet staple and it’s perfectly appropriate to keep more than a handful on rotation. From designs with loads of zippers to simpler picks that solely highlight the cut and fabric quality, there is a different leather jacket for every outfit and mood. 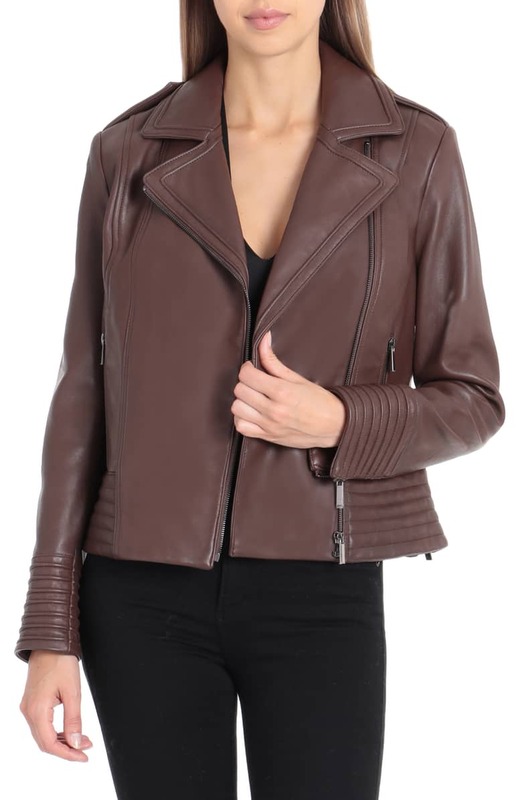 The design we have fallen for most recently, the Badgley Mischka Gia Leather Biker Jacket, is actually on sale, too! This coat has all of the details we appreciate in a moto-chic design thanks to an asymmetrical front zipper, a notch collar, classic sharp lapels and practical side zip pockets. Trapunto stitching along the cuffs and hemline creates a texture that sets it apart from the other leather outerwear styles already hanging in our wardrobes. See it: Scoop up the Badgley Mischka Gia Leather Biker Jacket (marked down up to 60 percent off its original $495, now starting at $198) while it’s available at Nordstrom in three colors and select sizes. Prices vary based on color and size. Prefer a different style? 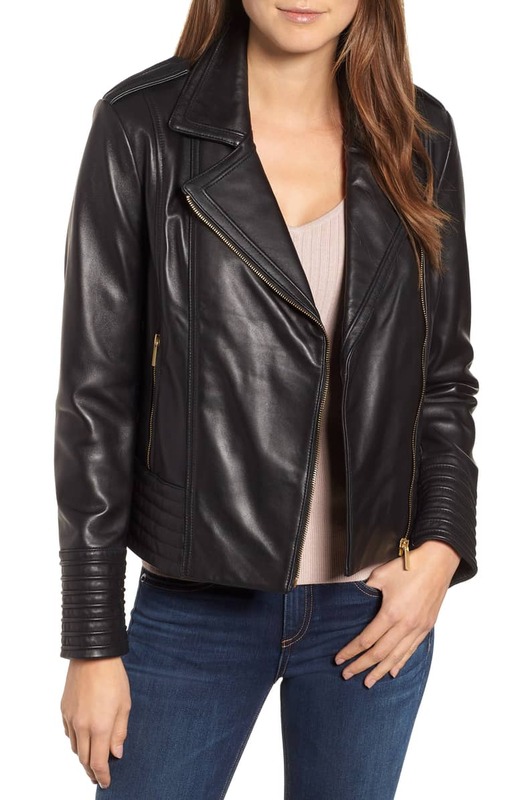 Check out all the leather jackets on sale at Nordstrom. The Badgley Mischka Gia Leather Biker Jacket is available in sizes ranging from extra small to large. Nordstrom recommends that shoppers who are in between sizes should order one size down. The jacket also comes in three colors we adore: classic black, chocolate brown and wine. The jacket is edgy enough to wear on a casual day with matching moto ankle boots, distressed boyfriend jeans and a graphic T-shirt. Still, we would feel just as comfortable wearing it over a shift dress with pumps for a day in the office. The biker jacket would also look great paired with our favorite flared dress pants, pointed toe pumps, a chiffon blouse and a black shoulder bag with matching gold hardware details. We could also layer the black version of the jacket on top of a maxi-length rib knit bodycon dress, trendy sock boots and a bucket bag. For a leather-on-leather ensemble, we could also slip into a black leather pencil skirt, a silk camisole and leather booties. The chocolate brown version of this biker jacket gives Us the perfect break from classic black and we appreciate its silver hardware detail. Forget all the style rules about not pairing black and brown! We’ll be wearing the brown coat layered over our black wrap dresses with black calf-high boots and silver jewelry to highlight the jacket hardware. This chocolate brown jacket will also make a lovely topper for a fit-and-flare dress in a fun floral print paired with brown over-the-knee boots. Fashionistas who love prints but aren’t fond of flowers may prefer to wear the jacket with a leopard or snakeskin print dress. While we love the chocolate brown and black colors, our favorite in the bunch is the wine option. 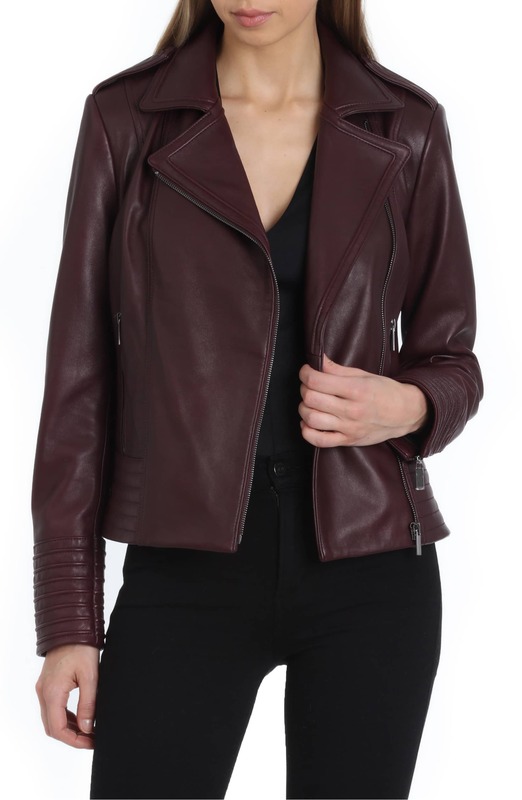 There is no better way to spruce up a wardrobe than with a leather design or anything stylish in a merlot hue. The wine biker jacket offers both! We’ll be wearing the wine-colored jacket on top of a long sleeve maxidress with pointed toe flats, a top handle bag, a long necklace and a pair of leopard print sunglasses. The Badgley Mischka Gia Leather Biker Jacket in any color will also look great with a silk top and an A-line midiskirt with ruffles or pleats. Shoppers who already own this designer leather jacket gushed about how soft the leather feels and how easy it is to wear in any season. They also appreciated that the jacket looks great when worn open or all zipped up. Several shoppers mentioned that they adore how well it fits. One shopper loved that the biker jacket falls to the right length since it stops just at the waist. Another shared that the design is cut so well that it feels tailored! The most popular color amongst reviewers is the black leather jacket and lots of shoppers appreciated its minimal gold hardware. Still, many shoppers who wanted a different look snagged the brown and wine versions. Many reviewers noted that they grabbed the jacket for themselves but several scooped it up as a gift for a loved one. Several shoppers mentioned that they tried on several leather biker jackets before settling on this design by Badgley Mischka.